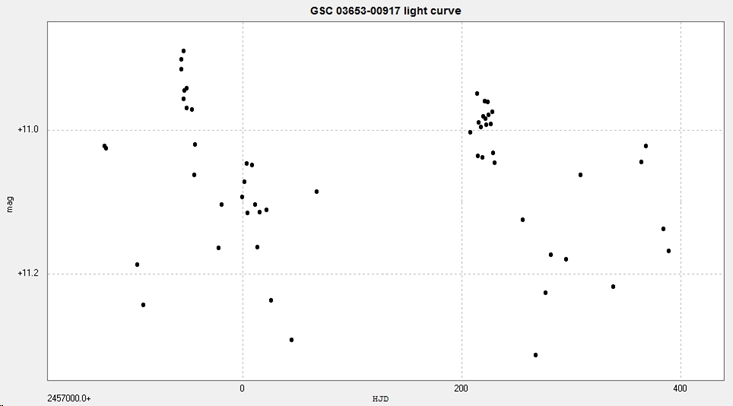 GSC 03653-00917 is a semi-regular variable with a period of 70 days in Cassiopeia. Discovery confirmed on 21 March 2016 by the AAVSO VSX. Light curve from 54 images taken with the Bradford Robotic Telescope Cluster Camera between 2014 August 4 and 2016 January 1. Images were with Cluster Camera's 'G' (RGB) filter. Magnitudes have not been transformed. Comparisons; UCAC4 721-002832 V=9.31 and UCAC4 720-002938 V= 9.41.